"Received he pan well protected during shipping and in a timely manner. 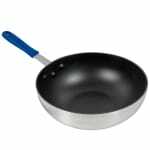 I have used it to stir fry vegetables and meat and it takes all of the..."
"Received he pan well protected during shipping and in a timely manner. I have used it to stir fry vegetables and meat and it takes all of the heat I can give it on my gas range. No signs of discoloring or warping. Great pan! It will replace not only my WOK, but also a few sautee pans that I have used as well."